Golfasian are experts at creating, designing and organizing golf travel packages and luxury golf vacations, all you need to organize is your game! Golf has been played for centuries and is at best challenging, at worst frustrating. To get the most from your Thailand golf holiday we recommend you consider our golf school vacation packages. The best thing to firstly improve on your luxury golf vacation is your attitude! No golfer can hit the perfect shot every time, there is always room for improvement, and the sooner all of us golfers accept this (myself included!) then we can enjoy our golf vacations in Thailand and improve our game at the same time. We must be willing to change a lot of things we may think we already know.Golfasian are delighted to provide the facility for both group, and individual tuition during your Thailand golf vacation. Whether you are a newcomer to the game, in the early stages of playing golf, or a more experienced player, then we can create custom golf packages to fit in with your schedule, and designed to give you greater enjoyment whilst playing the fantastic courses throughout your Thailand golf trip. Along with giving you the best golf course guides, we also employ a highly qualified golf professional year round. Our instructor can be booked in advance when you are arranging your Thailand golf vacation. Quality instruction is available for you on any Thai golf tour, ranging from the basic fundamentals, to more advanced playing lessons for experienced golfers. Do you want to train and learn from a PGA qualified professional with more than 30 years teaching experience, a veteran who has played professional golf on the Asian, European and Japan PGA Tours? Having played with the best in the world he can most certainly improve your golf game. Our instructor is based in Bangkok and travels throughout Thailand providing individual and group lessons to golfers. From quick fix tips to long term practice strategies, short game skills to course management, you can realize improvement in all aspects of your golf game while on a Thailand golf vacation. For individual, group, or playing lessons, our coach’s warm personality and enthusiasm will ensure your coaching and Thailand golf holiday are of great enjoyment. Depending on your requests lessons can be given in the format 1-2 hour instruction on the driving range, and our instructor is also available to provide playing lessons accompanying you on a round of golf. This helps develop what you have learnt on the range by assisting you on the course. With the amount of factors that influence your round such as the course layout, wind conditions, undulations, our experienced professional instructor can advise on the best solutions. Assistance and examples will be provided with all these aspects leading to better golf, lower scores and ultimately, more enjoyment. Putting this will concentrate on such areas as the stance, set up, grip, and stroke. An all round lesson including course management, shot selection and mental preparation, designed to improve you all round game and bring maximum enjoyment to your Thailand golf vacation. Golfasian also have affiliation with other leading golf teaching professionals at many of the top golf courses throughout Thailand. Our services can be adapted to suit the number of people attending, and amount of coaching required. These coaching options can be added to any of our Thailand golf packages so please feel free to email us with your requirements and we will design a personalized customized golf package for you. Learning about golf and being familiar with the rules are a major part of playing well and trying to master this very complex sport! Firstly and most importantly lessons are not just for beginners, even professionals enlist the help of a coach. 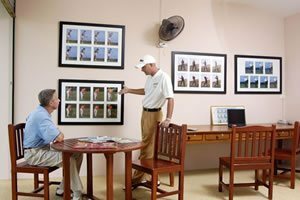 Having your swing analyzed during the custom golf vacations can have dramatic improvements on your game. 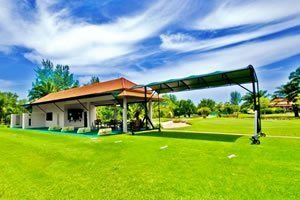 Stay and learn to play golf at Hua Hin’s top golf course. Black Mountain Golf Club, Hua Hin’s premier championship course, has opened its private villas to the public through Golfasian’s exclusive Black Mountain Golf Villa Packages. Stay course-side at these modern luxury villas, only metres from the golf course. Enjoy the 5-star experience at the Black Mountain Clubhouse and gourmet restaurant as well as discounted benefits of the wonderful Spa. Phuket’s very first dedicated Golf School, that comes complete with Golf Driving Range, practice greens and bunkers. In fact all of the best facilities that you would expect from any top quality Golf School, and situated right in the middle of the luxury Laguna area of Phuket. What better place to have a new Golf School than on the stunningly beautiful island of Phuket, with year round temperatures that average around 30c degrees, making it the perfect place to learn and play golf. Former PGA Asian Tour Professional Andy Combe, and his team of professionals, can help you achieve your goals, whatever they may be, and even if you have never played before you can learn to play golf from scratch with our new Beginners Golf Lessons. Add individual private golf lessons, group lessons, kids lessons, on-course coaching, driving range, chipping, bunker practice and the all important putting to that of our new Beginners Lessons, and you have found the perfect PGA Golf School at the new Andy Combe Phuket Golf School on this beautiful tropical island. Prices you can afford compared to other Golf Schools! Custom golf schools: Choose the number of hours, days or type of program you want (eg. short game only, women only, beginners only or low handicap school) and we will create a custom golf school especially for you or your party of 2 – 4 golfers. Half Day, Full Day, and Multi Day (plus Multi Courses) “Play With A Pro Packages”. Golf School Vacations are FUN in Phuket!